Brain food is not a myth, and a diet rich in fruits, vegetable, nuts and seafood will help your child to read smart and read well. While certain foods fuel the body for peak performance in athletic competitions, others fuel the brain to increase a child’s reading and learning capabilities dramatically. Learning to read the words on a page is only part of the educational process. Comprehending and remembering the information afterward is a significant factor in a lifelong love of reading and education. For an extra bit of reading help that will benefit your child well into adulthood, consider a diet high in the following foods. Antioxidants are associated with improved memory and cognitive functioning. 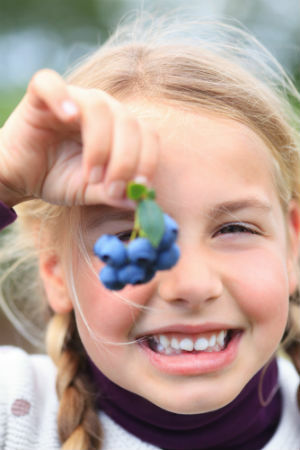 Blueberries and raspberries are wonderful examples of fruits that children tend to love. While kids may only eat a handful when the berries are freshly picked, they often tend to eat frozen blueberries like candy. Don’t be afraid to be creative. Rather than using store-bought jams and jellies on your child’s sandwiches, add sliced strawberries as an alternative. Eggs are a brain food high in choline, an essential nutrient that enhances the memory stem cells. While many children often turn up their noses at a plate of scrambled eggs, consider sneaking them into a breakfast of French toast or French pancakes. Instead of topping them with thick syrup and butter, add more of the antioxidant-rich fruit slices instead, perhaps in the shape of a smiley face or some other silly picture. Beans and yogurt are other kid-friendly foods high in choline. Fishy foods are not always high on the list of favorites for children, but all seafood is high in the essential omega-3 fatty acids that are so critical to brain and eye development. Instead of the standard plate of broiled cod, consider scallops or shrimp instead. Crab sticks are another fun brain food that can be eaten cold along with some of your child’s favorite dipping sauces. Instead of a baloney sandwich, substitute tuna fish mixed with leafy vegetables and a low-calorie yogurt. Other foods high in omega-3’s include flaxseed, walnuts, and sunflower seeds. For an extra bit of reading help for your child, try to stay away from certain foods that are “brain drains.” Foods high in processed sugars and additives tend to slow the child’s learning and comprehension abilities. Studies show that these foods can also lead to hyperactive behaviors, hampering the child’s ability to focus and concentrate. If you want your kids to read smart and read well, stick to basic brain food or contact us here at ReadSmartLearning.com for more information.